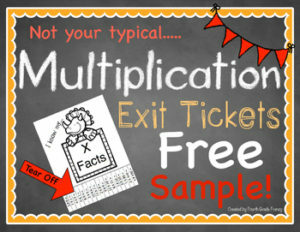 Try this FREE, quick, and easy sample of my multiplication fact exit tickets! Make several copies, cut on dotted lines, and hang papers around your classroom. Students tear off a strip to read and answer. Collect strips in a bin or basket. If you like this FREE sample, here is the complete resource for only $2.00!